I finally got time to benchmark the Raspberry Pi, Pi 2 and Banana Pi Pro for media server tasks. 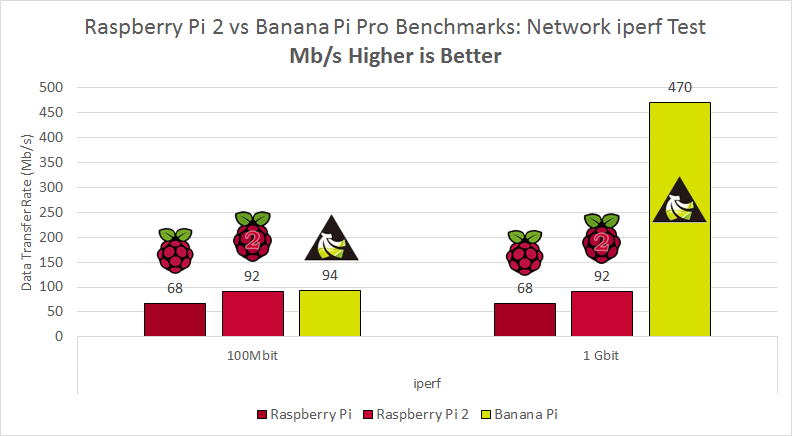 It is similar to my last comprehensive benchmarks comparing the Raspberry Pi and Banana Pi. Despite not much changing besides the CPU and RAM in the Pi 2, many people insisted my old benchmarks were not relevant. In the interest of science I have conducted the same tests with the Pi 2. 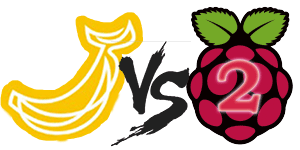 Read on to see how well it did compared to its old brother the Raspberry Pi 2 and yellow 2nd cousin the Banana Pi. Here is a quick summary of the specs of the Raspberry Pi 2 vs Banana Pi and Pro, notably the Banana Pi models have a faster processor and DDR3 RAM, SATA and Gigabit ethernet. The Banana Pro has the same specifications as the Banana Pi but has Wifi on-board so these benchmarks are applicable for both Raspberry Pi Alternatives made by LeMaker. I refer to the Banana Pro as Banana Pi Pro throughout this post. 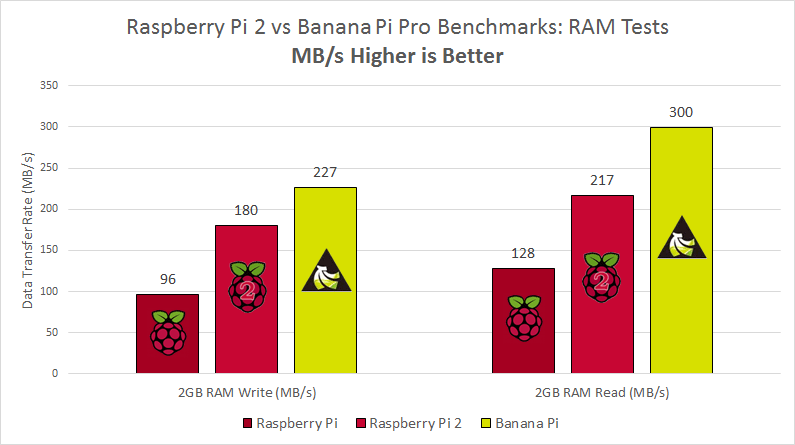 Raspberry Pi 2 vs Banana Pi Pro Benchmarks – Do SATA and Gigabit Still Matter? I used Bananian on the Banana Pi Pro because it has the lowest memory footprint of the debian-based distros available. For the Raspberry Pi I used Minibian because it has a low memory footprint for a Raspbian-based distro. The Raspberry Pi 2 had the latest Minibian installed with updates. Filezilla was used for FTP tests. Robocopy was used for copying from SAMBA shares. All tests were repeated 5 times and averaged to calculate an accurate data transfer rate. I did not test WiFi because – despite its convenience – I always avoid it because connections drop and speeds are overall worse than with ethernet. That may change as 802.11ac spreads but for now ethernet is rock solid and should be used for reliable NAS or media server setups for maximum speed wherever possible. SFTP was not tested because the overhead of the encryption is too much for these ARM processors to handle, limiting speeds to about 5 MB/s. I ran two CPU tests: calculating the first 5000 Pi digits and calculating the first 5000 prime numbers. Only the 5000 prime numbers test allows multithreading to take advantage of the multiple CPU cores on the Raspberry Pi 2 and Banana Pi. The Raspberry Pi took 168 seconds, the Pi 2 took 113 seconds and the Banana Pi Pro took 105 seconds. The Banana Pi Pro took 62% less time than the Raspberry Pi. The Raspberry Pi was not included because it only has a single core so multithreaded operations take the same amount of time as single threaded operations. The Raspberry Pi 2 took 57 seconds while the Banana Pi Pro took 52 seconds. The Raspberry Pi 2 took 28 seconds while the Banana Pi Pro took 53 seconds. The Raspberry Pi 2 was 50% faster than the Banana Pi Pro when it uses all 4 cores. For multithreaded processing the Pi 2 is superior to both the Raspberry and Banana Pi Pro. For this test 2 GB of data was written to and read from RAM. The Pi 2 has DDR2 RAM running at 450 MHz and the Banana Pi Pro runs at 432 MHz. The Raspberry Pi chimed it at 92 MB/s, the Pi 2 at 180 MB/s and the Banana Pi got 227 MB/s for the writing test. The Pi 2 was 2x faster than the Pi and the Banana Pi Pro was 1.26x faster than the Pi 2. The Raspberry Pi scored 128 MB/s, the Pi 2 got 217 MB/s and the Banana Pi Pro got 300 MB/s for the reading test. The Pi 2 was 1.7x faster than the Pi and the Banana Pi Pro was 1.38x faster than the Pi 2. 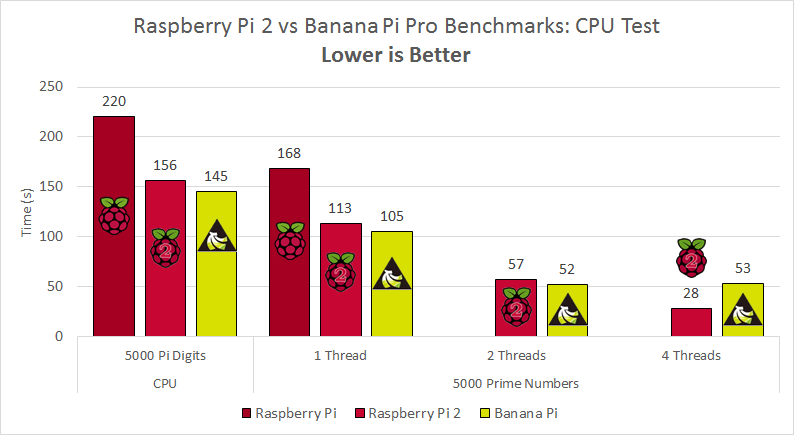 These results suggest that the Banana Pi’s DDR3 RAM is still superior to the Raspberry Pi and Pi 2. I set up an iperf server on a Windows machine and connected to via 100Mbit and 1000Mbit from the Raspberry and Banana Pi Pro. The Raspberry Pi and Pi 2 only have a 100 MBit ethernet port while the Banana Pi Pro has a 1 Gbit ethernet port. The Raspberry Pi scored 68 Mbit/s whereas the Raspberry Pi 2 got 92 Mbit/s and the Banana Pi Pro achieved 94 Mbit which is 1.38x faster over fast ethernet (100 Mbit capacity). Performing the same test over gigabit ethernet, the Banana Pi Pro scored an impressive 470 Mbit/s which is 6.91x faster than the Raspberry Pi and 5.91x faster than the Raspberry Pi 2. For all these tests, I used a 160 GB 7200 RPM 2.5″ Hard Drive formatted as ext4. In this test, I used a 1GB.zip file obtained from thinkbroadband. vsftpd was used as the FTP server on both the Banana Pi Pro and Raspberry Pi and Pi 2. For the download test, the 1GB file was transferred from the mounted USB hard drive to a Windows machine across a 100Mbit and 1Gbit line. In the upload test, the 1GB file was transferred to the mounted USB hard drive from a Windows machine across a 100Mbit and 1Gbit line. Uploading via FTP to the Raspberry Pi measured 7.49 MB/s while the Raspberry Pi 2 got 10.75 MB/s and the Banana Pi Pro yielded 17.3 MB/s making the Banana Pi Pro 2.3x faster if you are uploading data via FTP compared to the Pi and 1.61x faster than the Pi 2. Downloading via FTP from the Banana Pi Pro yielded 27.4 MB/s while on the Raspberry Pi I got a flat 10 MB/s – the Banana Pi Pro is 2.54-2.74x faster if you are downloading large files from FTP compared to the Raspberry Pi and Pi 2. Here the Pi 2 shows a 25% speed benefit over its older brother probably thanks to the faster CPU and RAM. I created a SAMBA share on the Banana and Raspberry Pi which contained the mounted USB external drive. In the download test, the 1GB.zip was copied from the SAMBA share to the Windows machine. For the upload test the same file was copied to the SAMBA share. Robocopy was used on a Windows machine to gather the time and transfer rate. Downloading 1 GB took almost 4 minutes from the SAMBA share on Raspberry Pi at 4.42 MB/s. Downloading 1 GB took roughly 1 minute and 35 seconds from the Raspberry Pi 2 SAMBA share at 10.5 MB/s which is 2x faster than the Pi. Downloading 1 GB took only 41 seconds from the Banana Pi’s SAMBA share at 24.68 MB/s – this is 5.58x faster than the Raspberry Pi. Uploading 1 GB to SAMBA share on Raspberry Pi was slower than downloading, 7.55 MB/s took about 2 minutes and 16 seconds. Downloading 1 GB took roughly 1 minute and 30 seconds from the Raspberry Pi 2 SAMBA share at 10.8 MB/s which is 1.3x faster than the Pi. Uploading 1 GB to Banana Pi SAMBA share took 38 seconds, transferring at 26.45 MB/s which is 3.5x faster than the Raspberry Pi and 2.45x faster than the Pi 2. The Banana Pi is the clear winner because it has gigabit ethernet. I am very curious to see how well the Pi 2 would do with built-in gigabit ethernet as it already performs at least 25% faster than the Pi. The same 160 GB 7200 RPM 2.5″ Hard Drive was used for the SATA tests. The procedure was identical to the USB tests except the hard drive was connected via SATA. For FTP uploads via SATA the Banana Pi Pro pulls 26.3 MB/s which is 1.5x faster than via USB. Compared to the USB transfer on the Raspberry Pi the Banana Pi Pro is 3.5x faster! 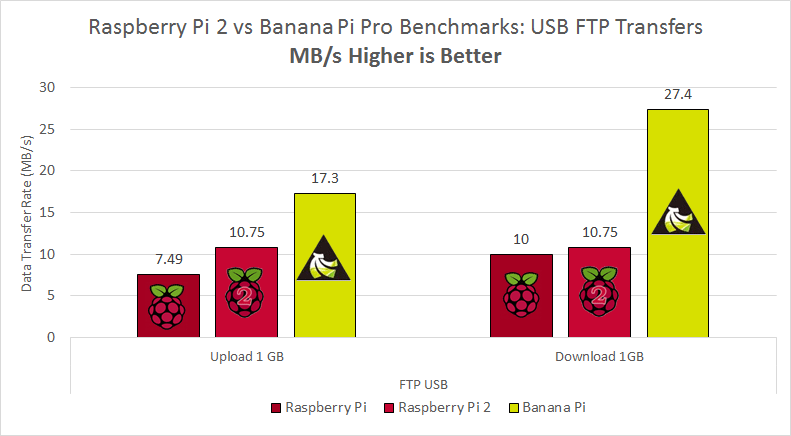 The Banana Pi Pro is also 2.4x faster than the Raspberry Pi 2 on USB FTP transfers. With FTP downloads via SATA the Banana Pi pushes 47.6 MB/s which is 1.7x faster than USB. Comparing that to the USB transfer on the Raspberry Pi, the Banana Pi Pro is 4.76x faster. You can transfer 1 GB in about 20 seconds using the combined power of the Banana Pi’s gigabit and SATA :). This is roughly 4.42x faster than the Pi 2 via USB thanks to the Banana Pi’s SATA and gigabit. The procedure was identical to the USB SAMBA tests except the hard drive was connected to the Banana Pi’s SATA port. Uploading 1 GB to a SATA SAMBA share completed in 38 seconds, transferring at 26.73 MB/s which was not significantly faster than the USB SAMBA share. It was still 2.4x faster than the Raspberry Pi 2. Downloading 1GB from a SATA SAMBA share completed in 39 seconds, transferred at 26.14 MB/s which was not significantly faster than the USB SAMBA share. This was 2.35x faster than the Raspberry Pi 2. 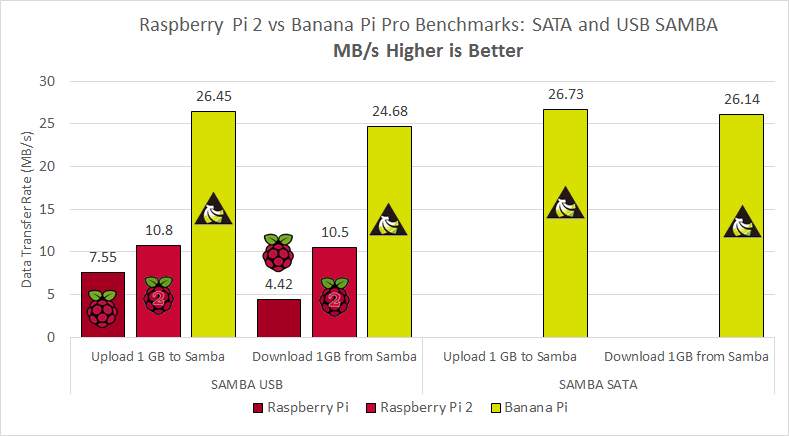 These results suggest a SAMBA overhead bottleneck that does not allow the full throughput potential of the Banana Pi Pro. The SATA FTP benchmarks support this theory. 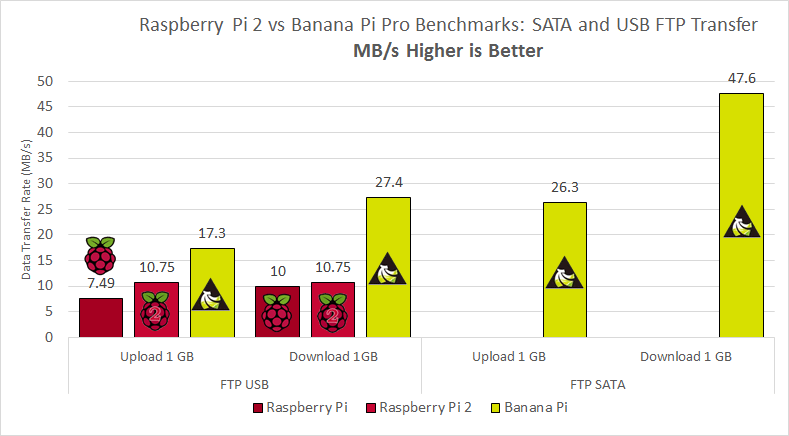 The significance of SATA and gigabit ethernet are still relevant from the Raspberry Pi vs Pi 2 vs Banana Pi Pro benchmarks. 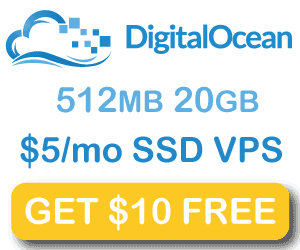 You get up to 4.7 times the speed benefit when combining the power of SATA and gigabit on a Banana Pi or Banana Pi Pro compared to a Raspberry Pi when transferring via FTP. Even with the Raspberry Pi 2 you get 4.4 times the speed benefit with a Banana Pi/Pro for data transfers over a LAN. The Pi 2 is a minor improvement for network throughput and a large improvement for multitasking and CPU intensive tasks. 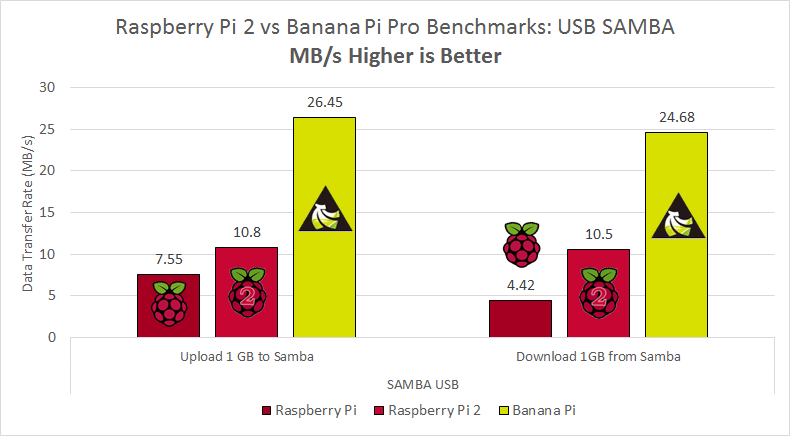 While SATA and USB speeds do not significantly differ over SAMBA, transferring over gigabit using the Banana Pi series still provides 2.5 times the performance benefit over a Raspberry Pi or Pi 2. If you plan to use the Banana Pi to serve media files to XBMC clients, going with FTP over SAMBA seems like the wise choice to minimize overhead. For media center related tasks like Kodi XBMC, OSMC or OpenELEC, the Raspberry Pi or Pi 2 is the preferred choice since a lot of development has gone into squeezing the maximum performance out of the video chip. The Banana Pi and Banana Pi Pro do not have proper hardware acceleration because of the Mali GPU chipset’s lack of documentation so it is unknown if its full graphics potential will ever be unlocked for media center tasks. My next benchmarks will compare the different file systems: ext4, NTFS and exFAT to see how well these devices deal with the overhead of converting for these systems so stay tuned for that post. Here are the ext4 vs NTFS vs exFAT benchmarks. Here are unRAR and PAR2 processing benchmarks.